My psychology prof finally came out with final exam marks. Oh, and then he came out with final course grades. On the file, I had high 70’s for a grade. At first, that seemed fine to me. And then I did the math (according to his course grade break down). Anyways… I did a little shopping today at my school’s bookstore. I desperately needed highlighters (I tweeted about it sometime during my December finals time – I ran through 3 yellow highlighters while studying for my cell biology final!) as I no longer had any. So I bought some! Luckily, they were running a little promotion… So I got these little beauties (Staedtler Textsurfer Classics) and two books from the bargain section. Fabulous colours, no? 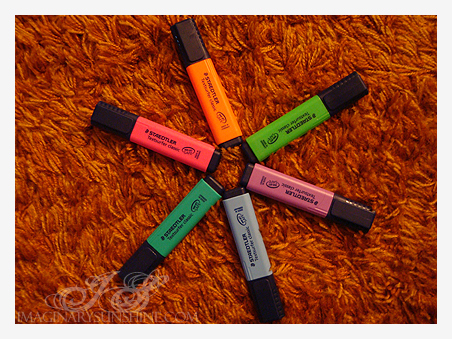 From left to right: blue, green, pink, purple, orange and this gorgeous teal colour. I didn’t get yellow (same price as the rest) because I wanted fun colours – plus the yellow was too bright for me (if that’s possible?). 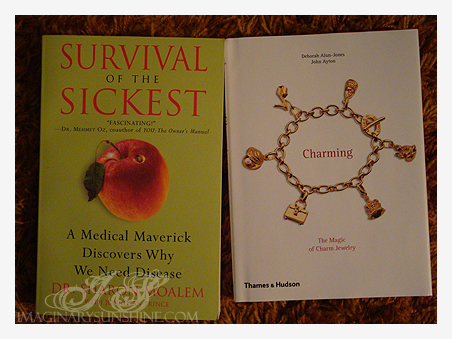 The books I got were Survival of the Sickest: A Medial Maverick Discovers Why We Need Disease by Dr. Sharon Moalem with Jonathan Prince and Charming: The Magic of Charm Jewelry by Deborah Alun-Jones and John Ayton. The second is for photo-inspiration for when I’m trying to figure out what to make with my beads, the first is for fun reading (because who doesn’t want to read a book entirely about diseases?). Both were discounted to $6.99 (one from $30, the other from $22). Photos! Yeah the bachelorette shows definitely seem to be better off haha. Jake is a good looking guy, and he already went through the show once, so I think he’s ready for almost anything now haha. Did you see last night episode? I laughed insanely hard. Some girl having an affair with a staffer. Sigh. They make it a bit too obvious when it’s scripted. xD I think the whole “affair” that just happened on last nights show was planned too. It just seemed kinda fake.. but they have to do what they have to do to keep the ratings up. I hope the prof fixes your mark! That’s no fair that it was lower than what it should’ve been. 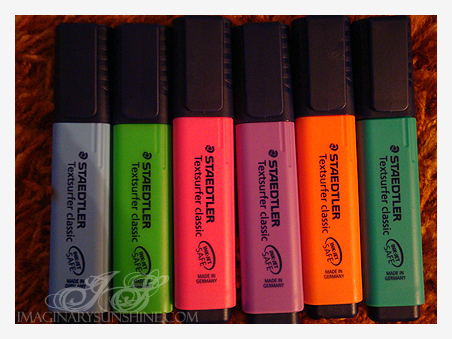 Ooh those highlighters are really pretty. (: I love the teal colored ones too. We don’t even have a book store, psh. We have book sales where they sell that kind of stuff every now and then.. but it’s usually stupendously expensive. Lovely books as well, and great prices. I hope you enjoy them.